There are many small business apps and gadgets available on the market today. Some can be called a novelty but many are an essential part of running a successful small business. It’s essential that you choose the right apps and hardware for your type of business. We have listed 7 of the most popular small business tools to help you run your business to its full potential. All small businesses will need to be able to accept card payments from their customers and Square is an excellent option for businesses conducting a lower volume of transactions. If you are just starting out or selling products from a temporary location, Square offers a small credit card reader that can be attached to you iPad or Smartphone. Square have their own payment processing services which are ideal for small to medium sized businesses. They offer predictable flat rate pricing with no monthly fee and reasonable transaction rates. Square offers one of the most impressive set of features which include advanced mobile processing solutions and affordable chip card readers. One of the biggest draws to Square’s payment processing solutions is the free iPad POS and smartphone friendly mobile app that is offered on signing up. For small businesses on the go, Square offers the most cost effective payment processing services. A payment terminal is an obvious starting point for any SMB and its an essential item for those who want to be able to do business from any location. A small payment terminal that can be used to accept payments from your customers in any form including credit and debit cards. 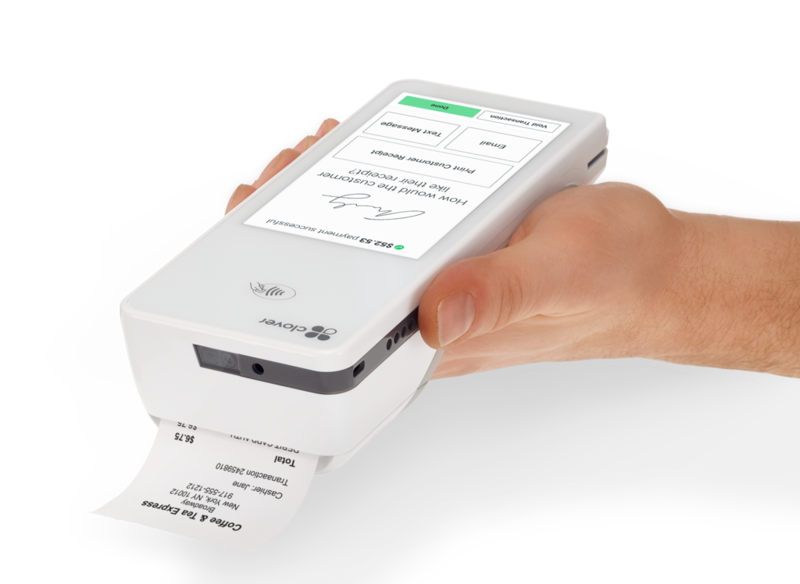 Clover Flex is a leading payment terminal designed with small businesses in mind. Clover Flex scored an impressive 8.1 out of 10 from 99 independent reviews, according to review website Comparisun.com. The terminal can accept payments in EMV chip, NFC payments, Apple Pay, Google Pay, Gift cards and cash on top of credit and debit options. It has a built in receipt printer and a scanner which makes this a multifunctional asset for any small business. An added advantage is that Clover Flex also provides you with detailed reports on device or on the web and this compact device can run a full POS if needed. Shopify is a solution that is suitable for retailers who sell online, on social media or any physical address. They have an e-commerce platform that thousands of online merchants have joined in order to sell their products. They offer online businesses a simple web building platform, custom domain name and help you build up your store with access to hundreds of themes. Shopify also incorporate POS into their offer to cover all the essential software needed to run your retail business online and from any physical address with a unified platform that makes it easy to control the ins and outs of your business. The software will allow you to manage unlimited products and inventory, keep track of your sales and growth while you fulfill orders in a single step. Shopify is ideal for smaller retail businesses and they offers secure checkout and shipping software. Shopify POS is an iPhone or iPad point of sale system which is part of the Shopify e-commerce suite. With Shopify you can manage your business from anywhere via the internet. Reasonable priced, Shopify is affordable for small startup businesses. For those who work mostly online and have staff in different locations, an app like Google Docs or Dropbox is essential. If you manage a group of people and are in the service industry you can have all documents deposited into the global interconnected fiber-optic network to keep track of all files in one location. You can limit access to these files to employees and colleagues that you need to share information with. Google docs comes with your Gmail account and it is easy to link up, alternately Office 365 provides the same features if you’re more comfortable with using Outlook. An alternate solution is to use Dropbox which also offers a similar feature. You can create a virtual link between all your internet connected devices and utilize their cloud saving capabilities by storing images, documents and video clips. For small business it’s important to be able to market your services or products adequately and also engage with existing customers. MailChimp is a very useful tool that offers easy to use templates with clear instructions for creating email newsletters for you clients. Sending these newsletters to your customer base regularly will help you promote your business and keep in touch with important information about special offers, sales, and new product lines. All businesses should keep their customer database up to date and take advantage of this type of tool which is very easy to use. Retain your customers by keeping them up to date on a regular basis. It is essential to be able to keep track of how much traffic your website generates. In order to be able to make educated decisions on what products or services to sell you will need to know where the majority of your visitors come from. Google Analytics is an innovative way to get statistics on the traffic that is generated by your website. Google uses clearly marked charts and graphs so that you can easily keep track of the demographics and your target market. You don’t need to be an expert to get started with the software and many guides are available on YouTube for beginners. Every business no matter how small will need to keep some form of accounting in place. The only way to be able to calculate your profit and loss adequately is by using software like QuickBooks. Many may think that it is a complicated accounting package, but with the built in instructions, bookkeeping is made easy with QuickBooks. All you need to do is to enter all the information accurately and you will be able to print out a profit and loss statement or any other report you need. You will need to put in the details of your suppliers so that you can enter their invoices and then your customers details and sales dockets. From the reports you will be able to reconcile your bank account, keep track of accounts payable or receivable and keep track of your customers and suppliers. QuickBooks can also be used as an inventory management tool if you take the time to enter all your products correctly from the beginning. With each sale products are taken from the inventory list so you can keep track of real time inventory levels.